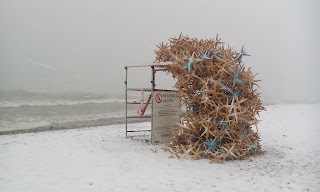 Last weekend, several "winter warming stations" were installed right on the beach near where I live. These art installations are intended for public consumption - we are meant to interact with them. 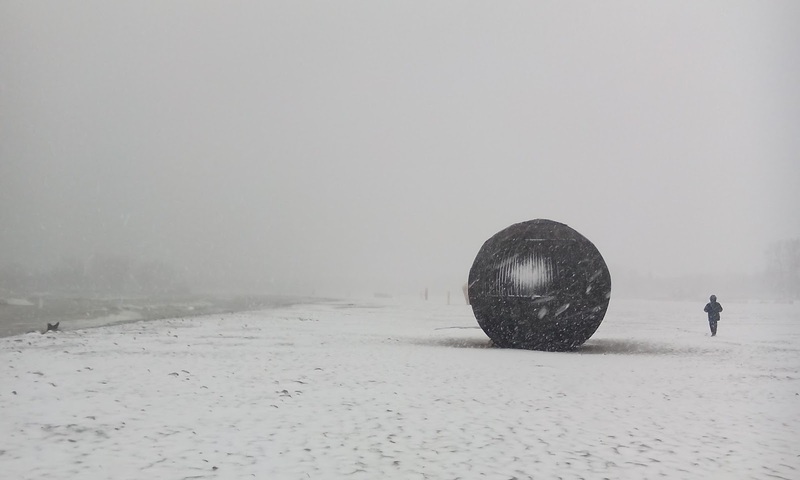 Climb into them (like the large round sphere lined with fur on the inside), reconstruct them (like the wooden ice crystals representation with movable pieces), or simply go inside for shelter from the wind, like the floating rope cube. Inside the sphere after you climb up the ladder.. However, by far my favourite is the sauna. It's an actual functioning sauna, with a small woodstove that the public can feed with wood, and then pour water or put snow on the rocks on the top, to create steam that fills the little narrow enclosure. It has wooden benches on three levels that can seat up to 6 people more than comfortably. Little sauna on the beach. There until March 20, 2016. When we walked by on the first day, it was running wonderfully and being tended to by the designers/builders. 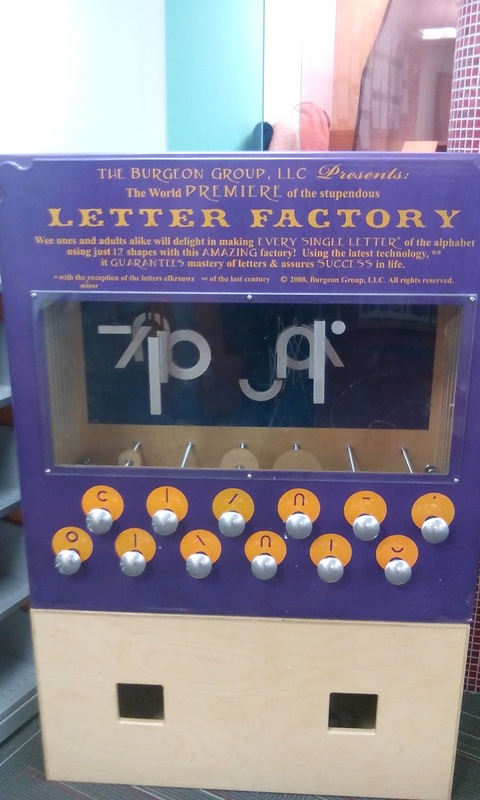 Eager to experience that magical, warm little box again, I have been walking by every few days to see if anyone else has gotten it up and running. Last night, I was in luck. The solar powered lights worked amazingly well, and the interior was well-lit even though it was dark outside. I pried open the door and quickly let myself in, where two other guys were sitting and drinking beer. We exchanged some small talk, and they soon left. I continued tending the fire and pouring water on the stones from a bucket that was inside. However, I soon ran out of water, so I put my coat back on and took the bucket down to the lake, where I tried to scoop up some water without getting my boots wet. At one point, I lost control of the bucket and the waves took it away from me. I watched helplessly as the frigid waters tumbled the bucket back and forth, worrying I'd never get it back. However, one big wave pushed it back to shore after a minute, and I quickly ran to grab it (conveniently, it had gotten pretty full of water) and ran back to dry sand before the next wave came. Armed with a better supply of water, I managed to get a lot of steam going. As I was happily sitting in the warm box while listening to the waves crash outside, a couple came in, amazed by the steam that greeted them. I chatted happily with them, a rare social moment for me, as I explained how it worked. They soon left to experience the other warming stations, but a few minutes later another couple came in, and we had similar conversations. This kind of art fascinates me - it is not in a gallery to be looked at and discussed. It is out in public, exposed to the elements, to vandalism, to deterioration and change over time. The creation itself is only the beginning of the artwork. The rest of the art is created in how we use it, the stories we tell, the way the steam escapes every time someone new comes in and the need to tend to the fire and water, the broken stove door, the bucket that almost go away, the missing solar light, the newspaper I stuffed in the missing light's hole so that the wind would stay out, the sound of the waves outside, the bits of firewood and driftwood colleted by others and left inside, the graffiti on the wooden walls, the pictures drawn on the walls in the steam that soon vanish, the smell of the cedar wood seats, the amazement or confusion of the people that walk in -- all these are part of the art, and I thoroughly enjoyed experiencing it. These unexpected encounters with people and the elements that make the sauna work (or make it harder to get it working) were unplanned social and artistic experiences. 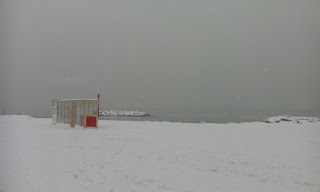 And even though we were strangers, the unity of experiencing the strangeness of a sauna in the winter by the lake made us temporary friends, collaborators, conspirators, creators. Strangers were unified by the strange, if you will. Which brings me to this past weekend. I have recently been placing a series of geocaches along the boardwalk in the Beaches part of Toronto, as a way to encourage people to come down and visit this incredible part of the city, regardless of the weather, and give walking along the boardwalk another purpose, and add to the enjoyment of the space, and perhaps discover new aspects of it. The geocaches I have hidden range from the easiest difficulty rating all the way up to the most challlenging, and it was two of these harder hides that remained unfound, despite several people trying really hard to be "First to Find (FTF)" and claim that elusive prize. My sister, also a geocacher, had really been wanting to come down and try her hand at some of them. Being smartphone-less as well as car-less, the badge of "FTF" is especially hard to come by, so when I was in her neighbourhood, she bargained with us for a ride in exchange for pastries, which we happily accepted, and brought her back home with us to the Beaches. As she sat in our kitchen trying to solve the puzzle required for the first one, an email popped up - a well-known cacher from Hamilton & crew had claimed FTF on that cache. The time they posted was current, so she suspected they might still be in the area. She still wanted to try for the really hard one, and I needed to find a cache for my own cache-a-day challenge, and there was one further past the end of the boardwalk that I had targeted for the day, so we walked together part way, and then I left her in the general vicinity of the cache while I went off to try and make my own find. I didn't end up finding it, but I did enjoy an unseasonably warm day by the lake, climbing up, over, around, and under rocks as I searched for a possibly missing container. As I was walking back, I saw my sister still in the area, along with 3 others, including one with a familiar face. It was a face I knew only from photos. The well-known (some would say notorious) cacher from Hamilton was someone I had communicated with many times via email or facebook. We greeted each other in mutual surprise, shaking hands and chatting as friends do when they suddenly come upon each other unexpectedly. I was introduced to the rest of the gang, and watched in great amusement as they wandered all over the place trying to find my cache. This particular hide was tough, as there were literally hundreds of places it could be, and the container itself was no bigger than a thumbnail. After watching them struggle for a while, I reminded them of a few things listed on the cache page, and their geosenses kicked in and they eventually made the find. It's not often you get to actually watch someone else find your own cache, let alone a team of dedicated and thorough experts, and it was quite a fun and different experience to actually be physically present while the search was happening, instead of just reading about it belatedly in the logs online. They mentioned a cache nearby that they wanted to go find next, and invited my sister and I along. I jumped at the chance, because after my failed attempt on the rocks, I needed a find for the day to keep my streak going. Seeing as how this one was in a tree and the expert climber of the group needed a bathroom before we could keep going, I invited her into my place as it was close by. It's funny how "strangers" quickly become people you trust. Having known at least one member of this group for years, seeing photos of his daughter, and reading social interactions between them and many other people in the caching community and beyond, there was no question in my mind. I have visited and gone to stay with many individuals all over the United States that I have met through online means in one way or another, always interacting with them extensively for years before the final meeting actually happens. And it's always the same - we're not strangers, we're friends. Necessities taken care of, we quickly walked over to the park and watched our expert tree climber do an amazing climb and sign all of our names in the logbook of the cache that was hidden up there. And then they were off to Hamilton, their Toronto adventure over with for the day. J was shocked by the "craziness" that led a bunch of adults to hop in their car and drive to a different city just to look for a miniature container and be the first ones to find it. It's something only a geocacher would understand. These unexpected encounters give the game another added element. It's not always strangers passing notes to each other like ships crossing each other in the night. It's not always a lonely game, a secret game. Sometimes it is intensely social, a group of like minded people having an adventure. Life is short. 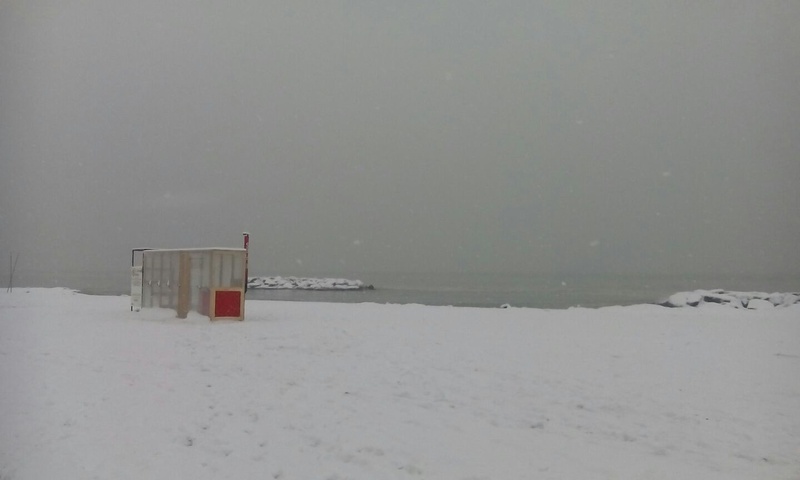 Why NOT hop out to a frozen lake after dinner and use a temporary sauna on the beach? Why NOT hop into your car and drive over an hour to go find a tiny container with your friends? Why not climb a tree, turn down a road that looks interesting, talk to that stranger, try something you've never tried? I don't wait for life to happen to me. I go out and find it. The fragility and temporariness of life is ever on my mind, and it invigorates me. I will always remember that surprising moment of meeting a pack of geocachers I had only ever seen on a computer screen. I'll always remember the sound of the waves crashing on a winter shoreline while I sat in a hot steamy slightly broken sauna. These are the experiences I will treasure and weave into stories for children and great grandchildren. These are the moments I will replay in my mind over and over again when my body and mind become unable to experience these same kinds of adventures. You don't have to go to New Zealand, Fiji, Europe, South America, Africa, to experience adventure. You don't have to spend any money, or say you don't have time. You can have adventure and excitement in your own backyard, in your own city or town. Just last night, I made my 900th geocache find. It wasn't in an exceptional place or a very difficult find, but I did end up driving around in circles due to malfunctioning electronic equipment, and yet I made the most of the convoluted journey, enjoying the night drive through strange neighbourhoods I had never been in. Adventures are never quite what you expect, especially when you're geocaching. Perhaps this is part of the appeal we crave novelty and new experiences and places. Geocaching almost forces that upon us. Go out and have an adventure today. In whatever way you want. Life is short! Yesterday, I was on my way home from work. It had been a long, tediuos day, and all I wanted to go was go home. I was not up for adventures. However, I needed to remain committed to my month long challenge, so I pulled out my phone and did a quick scan of my neighbourhood for one that wasn't too difficult. As I drove to the end of the street, I noticed a park appear behind the parked cars, and I smiled. Maybe today would be a good day after all. I quickly parked and approached the park. It was a rather large field, and there were a few people out with their dogs, who seemed quite happy to be running around off-leash. I noticed one of the "little free libraries" on a post at the edge of the park. I went over to open it and have a look at the current books inside. One caught my eye - a book by Oliver Sacks about ferns. I couldn't resist - traded for it, and closed the little door. 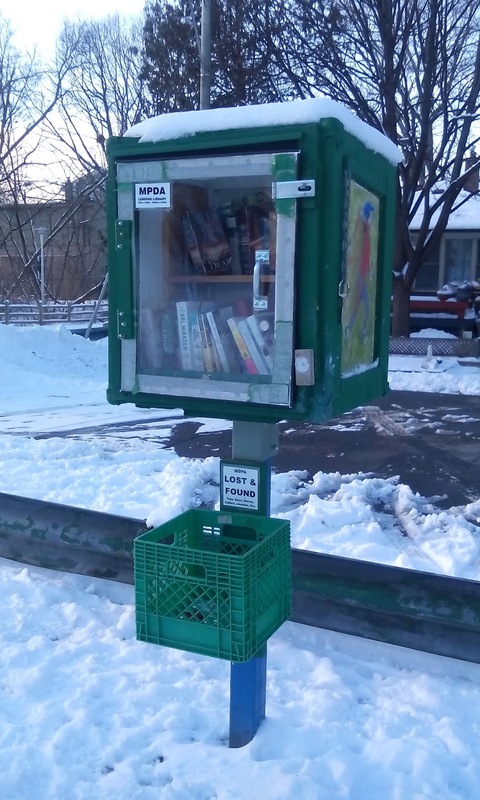 There was also a box underneath the little library for lost and found items - a neat idea! 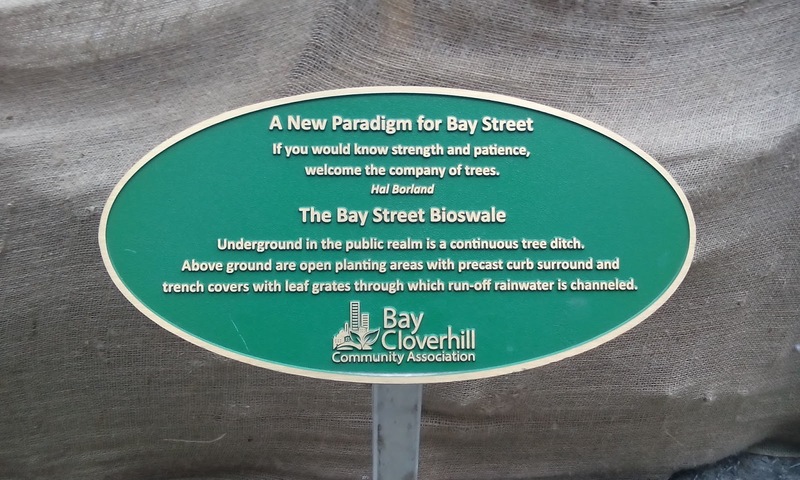 It's always fascinating to see the little quirks that neighbourhoods come up with. As dogs ran around in the open field, I felt fairly exposed as I made my way to the cache hiding spot. I didn't really need my GPS - the hiding spot was quite obvious. I mean, how could you NOT hide something here? There was a fence impeding my access, though, so I elected to go the long way around. I walked over to the edge of the park where there was a gate to access some stairs that seemed to go down into a ravine. I went in, and walked alongside the inner part of the fence, carefully moving branches out of my way as I went. 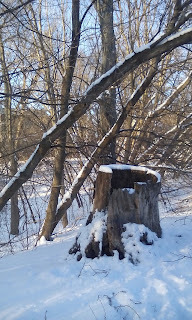 As I approached the stump, I saw that it was full of snow from a recent snowfall, and I had left my gloves in the car. I quickly found a stick and used it to move the snow around, brushing it here and there. A blue silly band revealed itself. "Uh oh", I thought to myself. Little trinkets like this should be inside the container. As I uncovered a small string of beads and an empty plastic baggy, I thought that certainly this cache had been "muggled" (i.e. 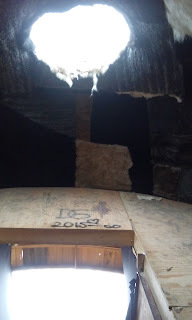 discovered by a non-geocacher and vandalized). However, as I persisted in my sweeping away of snow, I suddenly saw a small corner of a black box. Success! I had to pry it open with my car keys since the lid was frozen onto it, but I soon had it open and an otherwise empty container, except for the Logbook. I signed my name, put it in the little baggy I had found to keep it more waterproof, wiped off the trinkets I had found in the stump and placed them in there, too. I drove home, happy at my little mini-adventure and discovering a new part of my neighbourhood. I will have to go back when it's warmer and see where that ravine leads. The experience reminded me of when I was a child. I used to pore over my father's Toronto street guide map books, fascinated by all the patches of green, wanting to explore and discover where they all went. When I got into my teens and had the freedom to explore alone, I would put that large street guide in my purse along with a compass, and take public transportation to one of the large green patches. 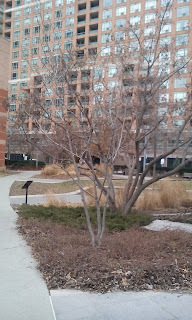 I discovered so many ravines, parks, and other fascinating hidden parts of the city this way. I would walk for hours, and eventually use the street guide and my compass to direct me out to the streets so I could figure out where I was and how to take public transportation back home. Geocaching allows me to do the same thing. It's not so much about hunting for the container, although that has its merits. It's about exploring areas I never would have known about, especially right here in my own city. Quiet parks, best-kept neighbourhood secrets, are suddenly at my fingertips. Today, I had to go deal with a parking ticket, and on my way home I decided to grab my daily cache. My first attempt was in a strange parking lot that said it was for church-goers only; however, there was no church in sight! I searched for a few minutes, but there was a lot of snow build-up and I wasn't too hopeful. 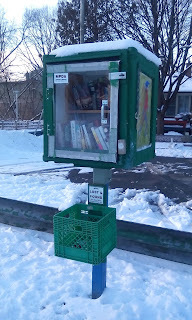 I continued on my way home and stopped for another, more likely-to-find cache - near a public library. The container was quickly found and signed, and then I stopped into the library to check it out. 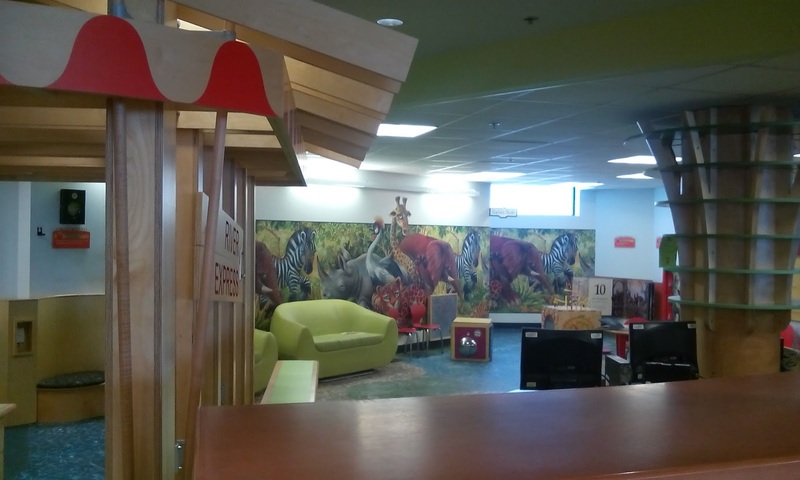 According to the cache description, Cedarbrae Public Library "was home to the first self-check-in and sorter in the Toronto Public Library system", and recently underwent a renovation. The library had a number of interesting features, which I enjoyed seeing. 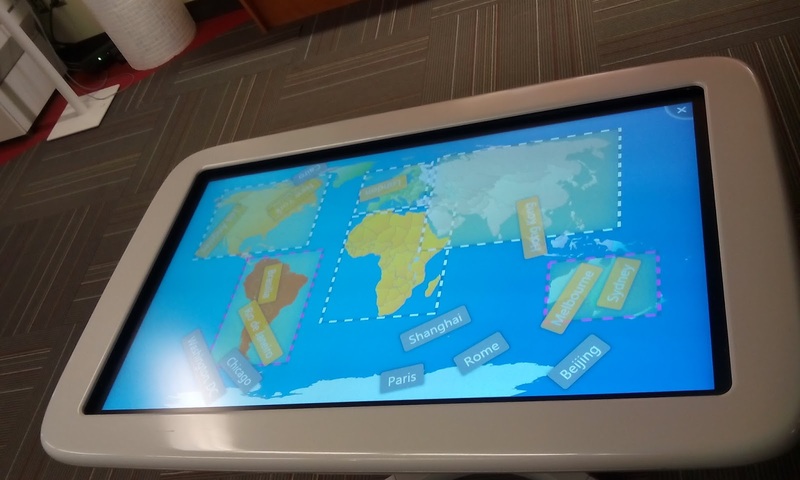 There was a manual letter-creating game for young children, an electronic table with different educational games, and a beautiful mural of animals in the children's books area. 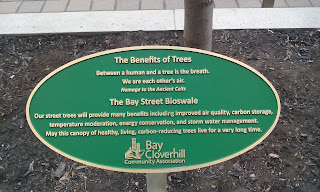 While I was there, I remembered to ask if they had any of the "City of Toronto Biodiversity Series" books. These are free, full colour photographic books that explain and explore the different types of life in the city. All you have to do is walk into any public library and ask for them (they usually keep them hidden behind the counters) and they will give you as many different ones as you want. I picked up two that I didn't have yet - "Reptiles and Amphibians of Toronto" and "Mushrooms of Toronto". Maybe next time I'm out geocaching, I'll be able to identify the name of that interesting mushroom or frog! This is why I geocache, and why I made myself start this February challenge to begin with. What could have been two uneventful days of going to work, coming home, doing errands/etc., suddenly turned into two small, exciting, interesting memories of my day. This past weekend, when temperatures dropped to near -30 C (-22 F), I felt the first difficulty in sticking with my cache-a-day challenge. 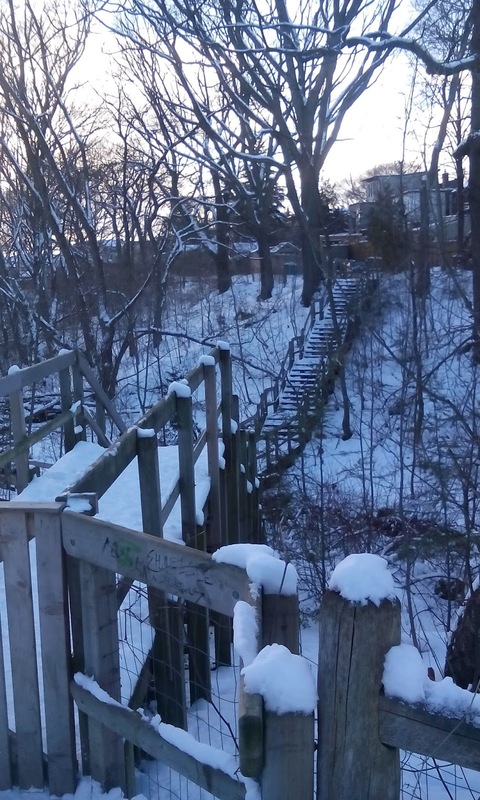 Having no desire to be out of doors for any significant length of time, I sought out caches close to home, caches that were rated with difficulty and terrain ratings of 1 (i.e. easy to find and easy to walk to). Thankfully, I was lucky, and have managed to keep my challenge going for half the month already. The other day, someone in one of my geocaching Facebook groups posted a link to a fellow blogger's post titled "The 10 types of geocacher". These 10 types were presumably created by the blogger herself, based on years of experience of geocaching and encountering other cachers, either in person or vicariously through written logs on cache pages. I found it interesting to see a geocacher self-defining other types based on lived experience, rather than the types proposed by Farvardin & Forehand (2013) (see one of my previous posts for further discussion). In my Applied Disability Studies masters program, I learned about the value of lived experience. Having been educated from a mostly traditional quantitative research perspective in my previous degrees (B.A. Psychology/M.A. Music), this exposure to the value of individuals' lived experiences, and how to include it appropriately in academic articles, was a fascinating eye-opener for me. For this reason I find the "10 type of geocacher" post intriguing; notably, the comments section. Because these 10 types were created by one single person based on her lived experiences, they necessarily don't always equate to others' lived experiences. The comments section has people suggesting further categories, because they don't see one that they fit into. There are also others who comment about the uncanniness of the accuracy of some of the categories. The need to categorize (and sub-categorize) ourselves within any defined social group seems to be something that we naturally do (e.g. Hogg & Reid, 2009). The "what type of geocacher are you" question asks us to think about individual motivations and preferences in order to answer it. Back to lived experiences. I've been blogging lately about a particular kind of lived experience I have with geocaching - an exploration of the general motivations behind geocaching, drawing on ideas from other disciplines or geocaching research itself in order to explore and play with these ideas in my own mind, and perhaps uncover truths about myself, that necessarily remain hidden to readers. But why do it in a public forum? I could easily journal these private thoughts and musings to myself. I'm not exactly sure of the answer. I have used this blog for different purposes since it was initially created. I use it to explore different writing projects, to share small poems or interesting thoughts on different things I see in the world around me. I also use it largely to share intimate, unique lived experiences while traveling. These entries seem to always attract a large following while I am in the midst of writing them, mostly by people who know me in some way. Currently, I'm writing about geocaching - sort of. Am I writing about geocaching the way other geocachers want to hear? Is there enough lived experience in my entries that others can relate too? Do my philosophical musings entice the mind of anyone other than myself? I've had writer's block lately, which is why it has taken me so long to write this post at all. My caching experiences from the past several days have been quick grabs due to cold weather or other commitments that prevented longer, more satisfying experiences. Nevertheless, these quick grabs have a motivation of their own - to stick with my personal challenge of finding at least one geocache per day for the month of February. I know many geocachers who keep up a "streak" for much longer - years, even. I've certainly never been that "kind" of geocacher and don't see myself becoming one. But making myself do it for one month is an interesting window into the lived experience of someone who does fall under that category. I can better sympathize with and understand the challenges these kinds of geocachers experience by personally experiencing them myself - frozen hands, an unwilling caching partner, the frustration of not finding your initial cache and having to reorganize your day to look for an alternate, etc. I'm not interested in the lived experience of these geocachers per se, but rather in the larger experience of putting myself in "someone else's shoes", so to speak. But perhaps I should be writing more about being in my own shoes? Would anyone other than a fellow geocacher really find any value in that experience, though? Travel writing is easier to relate to - we can all relate to the desire to vicariously live a new experience through the words of someone else. Writing about a particular sport or hobby that others do not necessarily share an interest in seems to be a bigger challenge. You, dear reader (yes, you...) - what would you rather I write about? I feel as if I need a direction for my next post. What do you want to hear? What draws you to this blog? Whether you're a geocacher or not, I'm curious. Sudoku, Crosswords, word riddles... our newspapers and grocery store checkout lines are filled with them, so there must be a large majority of us that enjoy these things. I was never really a fan of any of them - for me, there was very little intrinsic satisfaction in attempting to solve a complex sudoku puzzle or completing a cross word. Enter geocaching puzzles. Besides the 'Traditional' type of geocache, there are also various different kinds. Multi-caches, for example, lead you to walk/explore several stages, collecting information from historical plaques or secretly hidden containers that have partial numbers required for the coordinates of the final geocache container. Earthcaches have no container at all - you instead visit a unique geological location like a waterfall, cliff, mountain, rocks with embedded fossils, etc., and answer a series of questions that require you to gather information on site (measure fossils, take altitude readings, examine the colours of grains of sand in the location, etc). Answering correctly allows you to claim that Earthcache as "found". Letterbox caches hearken back to the late 1800's, where people used to leave containers in the woods and give others a series of clues, rather than GPS coordinates, in order to locate them. And then there are Mystery caches, or puzzle caches. These types of caches never have the final coordinates for the container listed online. Instead, you solve puzzles created by the cache owner in order to uncover the digits in the coordinates. These have captured my attention lately. When I was sick over the weekend, I turned to solving puzzle caches in order to pass the time. The creative range of these puzzles is endless, and the methods of solving as unique as the puzzle creators themselves. In order to get a feel for these puzzles, check out this one who's title and a string of strategically placed numbers holds the key to solving, this one that has something to do with knitting, or this one that requires specialized musical knowledge. I have created puzzles before that require a simple answering of grammatical questions (e.g. Should it be <its> or <it's> in this sentence?) or a simple "I Spy" type of puzzle where people need to keenly scrutinize an image of miniature toys and look for hidden clues; I've seen seemingly unsolvable puzzles that are simply a mysterious image and a couple of extremely cryptic sentences. I didn't start off liking geocaching puzzles - I would avoid them, preferring the traditional kind, for all I wanted was to get out and explore my city or go hiking. I did, however, enjoy creating puzzle caches for others to solve. There is a certain level of surprise delight when a stranger manages to crack the code of something mysterious I have invented out of my own mind. Recently I have discovered that I experience a similar sort of surprised satisfaction from solving someone else's puzzle. As I run through various options, ideas, and analogies in my head and on paper and suddenly one of them reveals numbers that make sense, it feels almost as if I've pulled back a curtain to a tiny corner of someone else's mind. My mind has suddenly gone through the exact same 'motions', if you will, that someone else's has. This is especially exhilarating when the method of solving is something uniquely devised by the puzzle creator. What is it that happens in these cases, exactly? It seems almost akin to Douglas Hoffstadtr's idea of "strange loops", first explored in his book Gödel, Escher, Bach: an Eternal Golden Braid, which I hesitate to even begin explaining. This quote might be a good starting point: “In the end, we self-perceiving, self-inventing, locked-in mirages are little miracles of self-reference.” (From his book, I am a Strange Loop). When I create a puzzle, I create traces of a process that my mind went through and publish it in a physical form (words/images on a screen) that can be perceived by others. They cannot, however, perceive the mind-processes that led me there. At least, not from the physical manifestation alone. The method of solving seems naturally so obvious to me, as the creator. The particular mind-process that I can self-perceive is ever present in me, a part of my identity. When someone else uncovers that same mind-process, it is almost as if they have somehow absorbed a sliver of my identity! They have mysteriously arrived at a conclusion no one else but me could possibly arrive at, and yet it happens all the time. We unlock slivers of others' identity all the time, not just when solving puzzles. This is the essence of empathy, of communication in general. Does that mean that the surprise delight when someone solves my puzzle, or vice versa, is an intriguing form of empathy? Does the puzzle solver somehow 'know' the puzzle creator in a tiny, microscopic, but nevertheless intimate, way? We remembered a dream that he had a few months ago. He was searching for something he thought was treasure, searching long and hard, and could not find it. I appeared in his dream, and brought him to where it was hidden in the ground, and uncovered it for him. When he saw what it was, he was annoyed because it wasn't a 'treasure' at all, just something 'everyday'. When he asked me, "Why did you bury it?" I replied, in my childlike way, as if it were obvious, "So it would be treasure!" I was fascinated by the dream to begin with, but now there is a new level of fascination with it after reading I am a Strange Loop and realizing just exactly what it could be that caused something so delightfully wonderful and strange to happen. Perhaps this is the draw of puzzles, for me. A glimpse into someone else's mind - a strange, lonely kind of microscopic intimacy, but fascinating nonetheless. On Friday, I had a job interview downtown early in the morning. I left home extra early in order to ensure I wouldn't be rushing and could find parking close by. After I parked, I still had about an hour to kill, so I went looking for my daily geocache. A friend asked me what happens if I can't go for an adventure in the woods that day, due to being at work during daylight hours or some other reason. Geocaches aren't all in the woods. I like to say there are two main kinds of geocaches - one kind is like hunting for treasure. The other kind is like being a 'spy'. 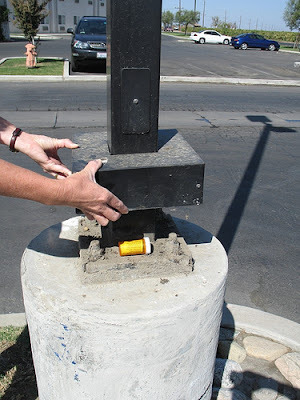 Geocaches in highly populated areas can be hard to find, not to mention hard to hide in the first place. Your container needs to be small enough to blend in to a highly populated area and avoid discovery. Many of them are magnetic, and no bigger than your baby fingernail. They contain a tiny rolled up logbook, and that's it. It was one of these I was searching for today. The pleasant walk on paved city sidewalks meant that I was not getting my interview clothes dirty. When I got to where my GPS was zero-ing out (i.e. it was saying I was 0 metres away from the cache), I saw the most likely hiding spot - a lamp post. 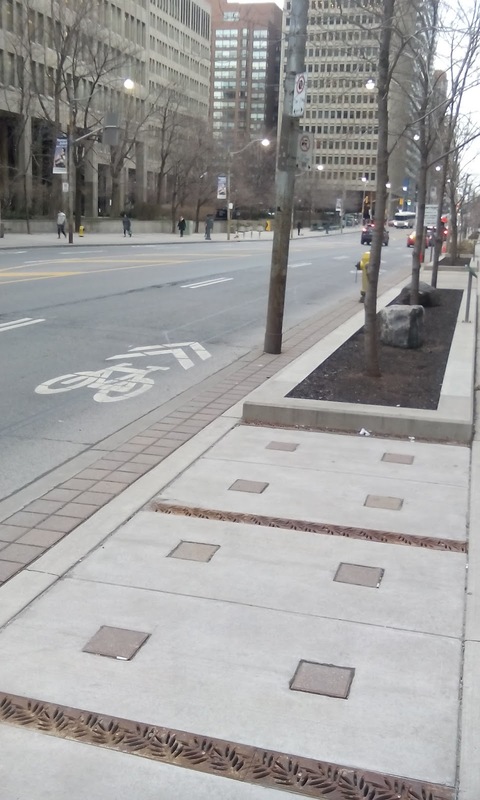 As you can see from the sample photo, lamp posts often have skirts which, unknown to most people, can easily be slid up to reveal a hiding spot. Since I was fairly certain where the container would be, you'd think it would be easy and quick to retrieve it. However, with this type of cache, you don't necessarily want other people to see what you're doing. Not only will you look highly suspicious and arouse concern, but 'muggles' (a term geocachers have adopted to refer to non-geocachers) may very well go back and remove, damage, or vandalize the container. So, what to do? Well, the best option is just to wait for a pause in the walking throngs of people, so that is what I did. A quick lift of the 'skirt', and the container was revealed and in hand. I signed in, and then pretended to be looking at my phone while some more people walked by, until I found another moment to quickly return the container to its location, none the wiser. I had a similar experience with my cache find yesterday as well. I was in Hamilton for a birthday party, and on my way home, I stopped at a park and playground very close to my friends' home. The write-up about this location was interesting. A simple playground in a little park on a side street likely would not have caught my interest had I just taken a walk by there. However, the person who wrote the 'cache description' on the website explained that this area has many group homes, and that they actually hid this container with some of the individuals from the group homes who work there. They had adopted geocaching as an extra element to their group walks, to give their walks a purpose. While my finding of the container was relatively quick and uneventful (besides having to pretend to artistically photograph my keys on a tree stump in order to camouflage my removal of the container from the lone woman sitting on the swings nearby), the experience of being in that space with the knowledge of how other people use it made it stand out in my mind. 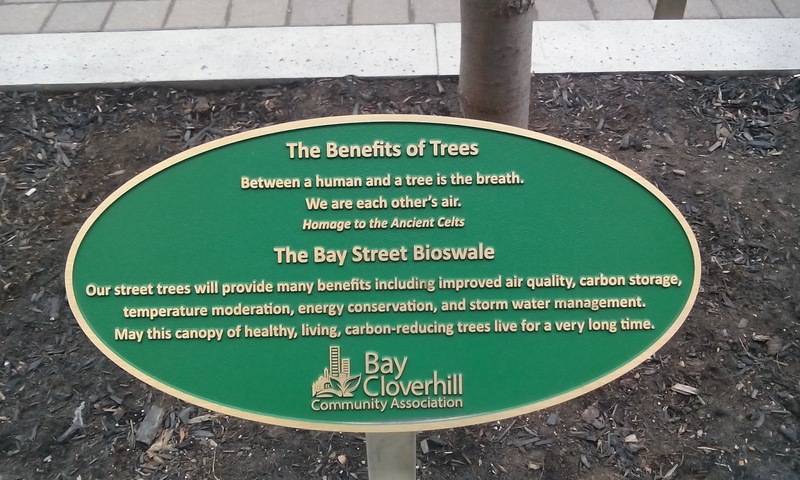 A simple park in a nondescript neighbourhood suddenly had a rich tapestry of meaning revealed to me. 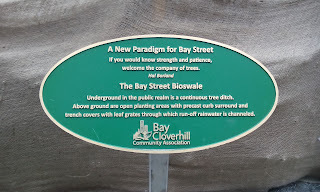 The one I had found downtown the day before also revealed aspects of the downtown that were previously unknown to me - a small park/garden amidst the tall office buildings that I hadn't known existed, and some newly planted trees and interesting signage explaining a revitalization project. I was reading an academic article on geocaching this morning (Zeng, 2011). It was a fascinating exploration of the deeper reasons and meanings behind this unique activity. One idea that stuck out for me was the one I was exploring above - this concept of rich meaning of 'spaces' being revealed to me through geocaching; meanings that would otherwise remain completely hidden from me. Geocaching allows anyone from anywhere to hide a container of their choosing, in a location completely of their choosing, and write whatever they want on the cache page for others to read (within limits - mainly, it must be family-friendly and non-commercial). Zeng says, "Geocachers, as ordinary practitioners of the everyday world, challenge the technocratic - reductionist space by trying to transform it into an existential space." In other words, we take the precision of military GPS technology - the ability to use electronic and satellite devices to minutely track the exact location of something using latitudes and longitudes - and we in a way rebel against this concept by creating spaces rich with meaning (geocache containers/hiding spots/write-ups) that are un-trackable; that exist as a variety of super-imposed layers intertwined with the physical space itself. In Zeng's words, "...Geocachers reject this top-down management (...) and insert into the operational space of grids personal stories" and "... participants shift their identity from passive users of high technologies to active creators of their own experience [emphasis added]." This interaction with others' stories of seemingly 'mundane' spaces seems to be a vital part of geocaching for many people. We are drawn to geocache not only abroad when visiting new places, but also in our own backyards, for it allows us to discover hidden nooks of our own neighbourhoods that we otherwise never would have discovered. It also allows us to "...weave [our] personal narratives with those of others." Sometimes, our personal stories interact with the stories of others in more than a theoretical way, as happened for me this morning. I went for a quick drive to go find a newly published geocache. New caches often result in multiple people rushing to go find it at the same time, because another aspect of the game is the 'race' to be the "First to Find" (FTF). This results in many unexpected surprise encounters with other geocachers, and today was no different. As I was signing in (first! ), a couple and their child approached me. I had run into them at an "FTF" once before, so we were familiar to each other. We greeted each other as friends, not strangers. Accidentally running into another geocacher, even if it is a complete stranger, often feels like running into a friend. There is something about this unique game of ours that draws us together with a bond of understanding. Having interacted with each other's personal stories and spaces by finding each other's hidden containers and reading each other's cache descriptions or "Found it" logs, a live face-to-face meeting results in a kind of familiarity that is hard to explain, but nevertheless a vital aspect of the game for a lot of us. *all quotes are from: Zeng, M. (2011). 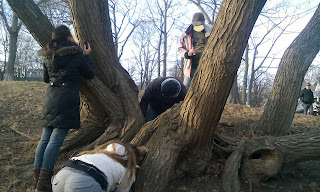 Examining Geocaching Practices through a Mobilities Lens. Proceedings of the Media Ecology Association, 12, 113-121. The February Blues. I assume everyone gets them to some extent, at least up here in colder climates. Despite this winter being unusually mild, it has still been dreary and long, at least for me. The lack of snow also doesn't help, for the small beauty that softly falling snow brings is often the only relief from the brown and dry scenery. In order to combat these February blues in my self, I have decided to challenge myself to find one Geocache every day for a month. For the uninitiated, geocaches are small containers that are hidden in the woods (generally), like treasure boxes. They typically contain small dollar store trinkets as well as a Logbook where you sign in with the date that you found the container. People all over the world hide these containers in their local areas, and then post the GPS coordinates (latitude and longitude) on the website geocaching.com. If you feel like going 'treasure hunting', all you have to do is log on to the website, look for geocaches in your area, input the coordinates into your GPS device, and off you go. What is it that compels us geocachers, mainly adults, to go looking for plastic containers in the woods? I think every geocacher has their own answer. For me, part of it hearkens back to vague longings in childhood where I would have periods of desperately wishing to discover some old treasure map that would lead me to a secret place and find a box full of mystery. It's not about the trinkets for a lot of us - if you see something you like, a nice pebble, eraser, or foreign coin, the rule is to trade for something of yours. But most people just find the geocaches for the sake of the hunt, the adventure itself. Someone suggested that I blog about my February challenge, so here I am. I'm not really sure if I'll write every day, or if I'll have anything worthwhile to say. But perhaps that is part of the challenge for me - to find meaning in the mundane. To craft words that can bring others with me on small, city-living adventures. That is a writing exercise that is much more challenging that taking my reader with me to the stunning landscapes of New Zealand or remote beauty of Fijian islands. Today there were two geocaches. I needed to get gas, so I got out of bed much earlier than I normally would have, and went to my favourite gas station a few minutes away. I checked the map and there was a geocache in a park closeby, so off I went. It was a simple cache in a tree behind a children's plagyround. The playground itself was a tiny dot in a vast, open field. There were obviously no children playing in this frigid weather. Seeing as how I had the whole morning ahead of me, I drove to a nearby ravine with a creek to look for another. The trail was muddy and wet, and I had to climb over and under several fallen trees, and carefully move branches out of my way as I went. The large-sized container was nicely hidden in the side of a fallen tree. As I opened it, I immediately noticed a little beaded charm with a peace symbol on it - the signature swag of a fellow geocacher that I know. It made me smile - here I was, in some woodlot in a random part of the city, alone and cold, and I see the sign of a friend. Sure enough, there was her name in the logbook, signed almost exactly a month ago (January 3rd). She had been the last person to find it before me. I feel as if I should write something philosophical about small connections like these, and what they mean in our lives. But some writing just can't be forced. 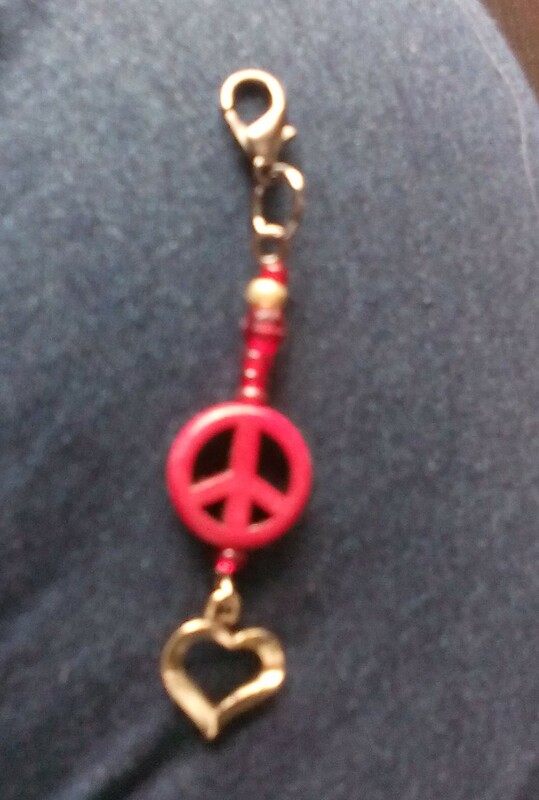 The peace charm made me smile, and I took it home with me (leaving my own signature swag, a small card with a bird photo on it, in its place). Right now, I'm typing on my bed, watching the birds at my feeder. There was a Hairy Woodpecker at it just now, and it carefully picked through the sunflower seeds to find a peanut, and then flew off to a nearby tree with its own newly found treasure. That made me smile, too.